Once you discover what a mandala is you’ll begin to see them everywhere! We often associate the word mandala with the circular designs that have repeating colors, shapes, and patterns radiating from the center. Mandalas can be precise, carefully measured, geometric, and perfectly symmetrical, or in contrast, free flowing, organic, and asymmetrical. Mandalas are often drawn in circles but they can also be drawn in squares. In the Hindu and Buddhist traditions, mandalas are an object of meditation to aid in one’s spiritual development. The imagery depicts the universe and the symbols represent one’s spiritual journey, the cycles of birth-life-death, and the interconnectedness of all living things. The Hindu tradition focuses on the realization of the self as one with the divine. Whereas in the Buddhist tradition, the emphasis is on the potential for enlightenment (Buddha-nature) and the pictures within the mandalas illustrate the obstacles that one has to overcome in order to cultivate compassion and wisdom. Drawing mandalas in this tradition follows strict rules. Mandalas are found across all cultures. Calendars follow cycles of time. i.e., Gregorian, Astrological and Mayan calendars. Snowflakes, flowers, and shells like the nautilus pictured above are all examples of where mandalas show up in nature. The cyclical patterns of the moon and seasons are also seen as mandalas. Carl J. Jung, Swiss psychiatrist introduced to the West the practice of creating mandalas for self-expression, discovery, and healing. In Jung’s daily practice of creating mandalas, he discovered that the shapes, colors, and symbols reflected his mental, emotional, and spiritual well-being at the time that he created them. He noticed how his mandala drawings changed as his mental and emotional states changed. Reflecting on these mandala drawings, Jung concluded that our subconscious and conscious selves are always seeking balance. In Jung’s work with his clients, he would have them draw mandalas. He observed that through creating mandalas, it helped to soothe patients experiencing chaotic psychological states. Jung also identified universal patterns and archetypes that reoccurred in his and his clients’ mandalas. When creating mandalas for personal enjoyment and reflection, there are no rules. One can draw symmetrical patterns or fill the circle with shapes and colors in any way. It is entirely up to the person drawing the mandala to decide. I invite you to explore this practice of creating personal mandalas. 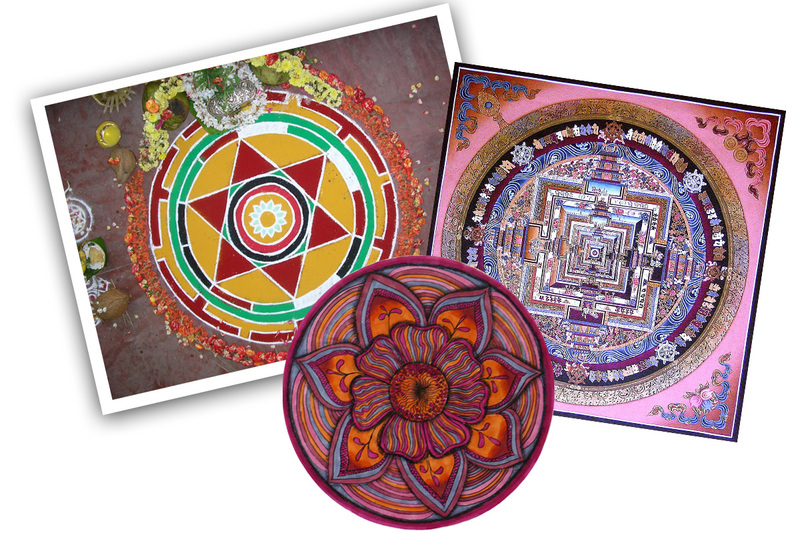 Participants who have taken up the challenge to create 100 mandalas in 100 days have experienced the following. Thank you. Mandalas and coloring came to my my life at a perfect timing. 64 years. I stay in presence in creativity and love. There is be.